The people of Upper Nile state are either spiritualists/traditionalists,Christians or Muslims.Upper Nile has the highest population of South Sudanese Muslims in the country,due to it's location in Northern South Sudan. Those who practice Islam also the majority of those who were known to protest for the need of a secession.As they believe that the North not only ignores the needs of the Southerners but also ignores the fact that there are Muslims in South Sudan. Live in a grassy region that is flat and virtually treeless. During the rainy season, this area floods, so that much of it becomes swampland with various channels of deep water running through it. They are part of the Luo group of people which reside throughout East Africa,Anyuak people are also found nearby is Ethiopia. 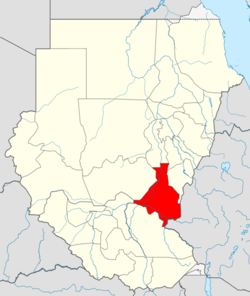 The Jum Jum people reside in Northern Upper Nile State but the majority are found in Sudan. The Maban are originally from the Luo group and believed to have separated from the Shilluk in Soba near Khartoum,due to the collapse of the last Christian Kingdom of Makkura.They later migrated to the Baro River area. Mabaano people live in Upper Nile state in Maban County, the Manbano and Buldid clans are also found in Maiwut county. Traditionally,every October the Maban perform 'the sacrifice feast' which is used to confess all their sins and to ask their supreme being (who is their God) to grant them good health and to ask for tolerance towards their actions. Kodok (Fashoda) is the location of the infamous 'The Fashoda Incident' (1898) were there was the climax of territorial disputes between the United Kingdom and France. It brought the United Kingdom and France to the verge of war , but ended in a diplomatic victory for the UK.